Great site! 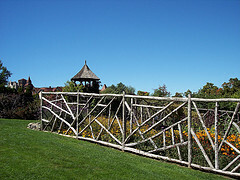 Here is a photo of our fenced-in garden. So far, we have had very little deer activity, although the woods near our house is home to many deer. They are beautiful animals and I have always enjoyed watching them. However, after several seasons of losing all our vegetables to the doe-eyed denizens, my husband threatened to get out the 12-gauge. Not wanting an antlered trophy in my dining room, I had this 8-foot fence installed. We have noticed some deer tracks near the garden, but so far, no deer have jumped the fence. Well, building fences like this would be of great idea than using other harmful repellents against the deer. This will make them seek for other routes and I am sure that they won’t look back in this route, once they learn that this is not accessible. Wow! What a fence. Great new deer site.